Valerie's Guest House — Caribbean Affairs Inc. Welcome to Valerie's Self-contained five bedrooms Guest House, situated close to the Central Business District of Port of Spain, Trinidad in the suburbs of St. James where all the action, activities, and shopping areas are located. With public transportation in our area, access is easy and cheap to and from Valerie's Guest House. Our beautiful Guest House offers quality rooms in a clean, safe, secure, quiet and comfortable environment for both business and leisure travelers with low, inexpensive, competitive and affordable rates starting at US$90.00 a night. We are an inexpensive Guest House with quality air-conditioned rooms, private or shared bath, hot and cold water, and wireless internet. In addition, each room is equipped with a microwave, cable television, and coffee machine. 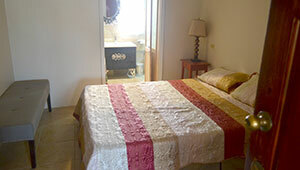 Five bedrooms occupancy from April thru October (3 nights minimum stay). US $100.00 per night, per room. US $80.00 per night, per room. US $120.00 per night, per room. 30% non-refundable deposit is required to secure reservation.